Slightly reserved race regulars who want to be close to both the track and the village. Home to some of the best Beermountain private parties. Long term future unknown, pitch allocations still being adjusted to remaining space after construction of the visitor's centre. Be careful looking at images more than 12 months old, as the layout is now very different. If you have heard about Maison Blanche, or "MB" as many call it, you will know that its a popular choice and has always hard to get tickets for. Well now it is even harder. Things have been changing on the site the early 2000's. 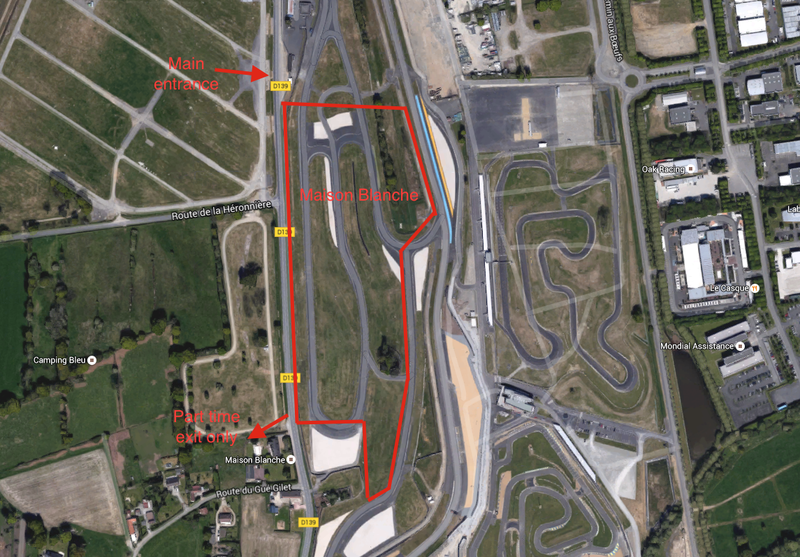 After operating in recent year's as a marked space site in 2014 a Porsche Visitors Centre was built and the private mini track which runs around the campsite expanded. The result of this is that it is now about 30% of its original size, making it almost a boutique campsite. A big favourite with it's loyal regulars, it is situated just past the grandstands. Facilities are reasonable and the atmosphere is good, possibly a bit more reserved than some others. 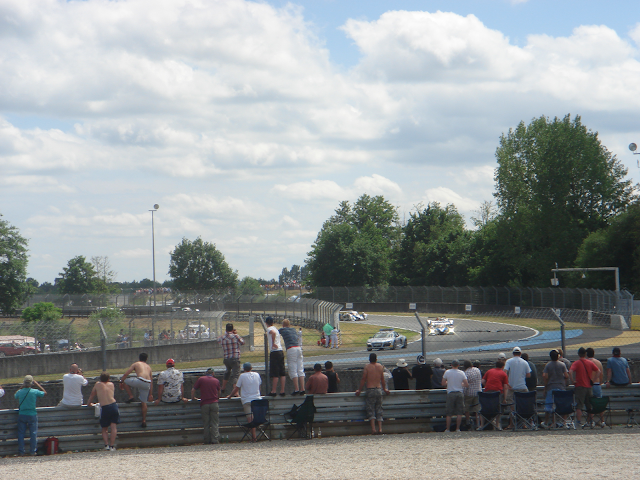 It has both track side areas and more peaceful parts, however much of the original spectator banking has recently been removed. The remaining parts are to be found at either end of the trackside portion of the site. Pitches are marked and numbered. There are triple sized pitches located next to the roadside wall and standard pitches dotted around the site between the new tarmac track areas. 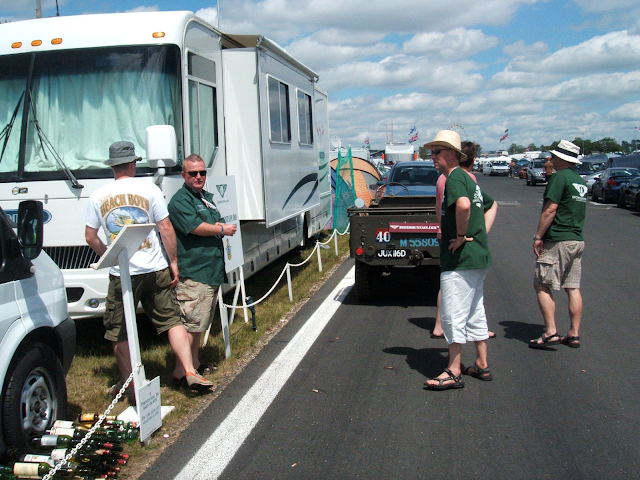 The triples are popular with motorhome owners as they provide a pitch at least 15m deep. Easy walk to the village and okay viewing of the track from parts of the site. There is no dust and the site is well drained. With the reduced campsite size there are now good toilet and shower facilities. The main drawback is the lack of camping space and ticket availability. 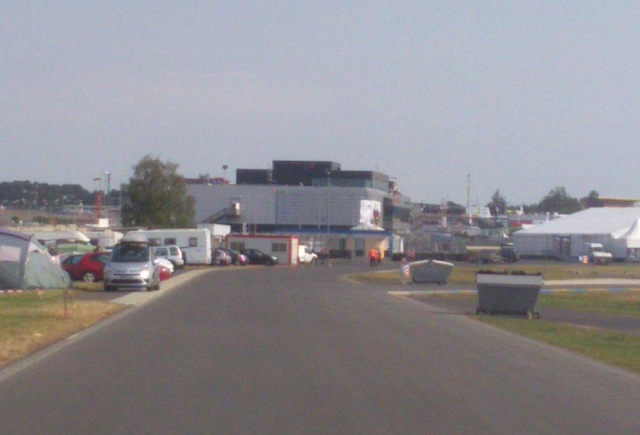 There is nothing other than the circuit here, but the museum, the village and the stands selling things are all close by. The original Maison Blanche (White House) visible in the Steve McQueen Le Mans movie can still be found on the campsite. The track was moved back from here as it was too dangerous for a modern circuit. Fifth year on MB and as good as ever. Many positives, with a few negatives thrown in to keep us on our toes. Although the number of happy campers seems to be declining due to the ACO placing more corporate enclosures on the site, the facilities haven't, so queuing times are down. Negative was that there was no hot water in the temporary shower blocks until Tuesday (or even Wednesday) but the block near the main gate was fully operational from the Sunday. The viewing areas are diminishing, again down to the increase in corporate areas. 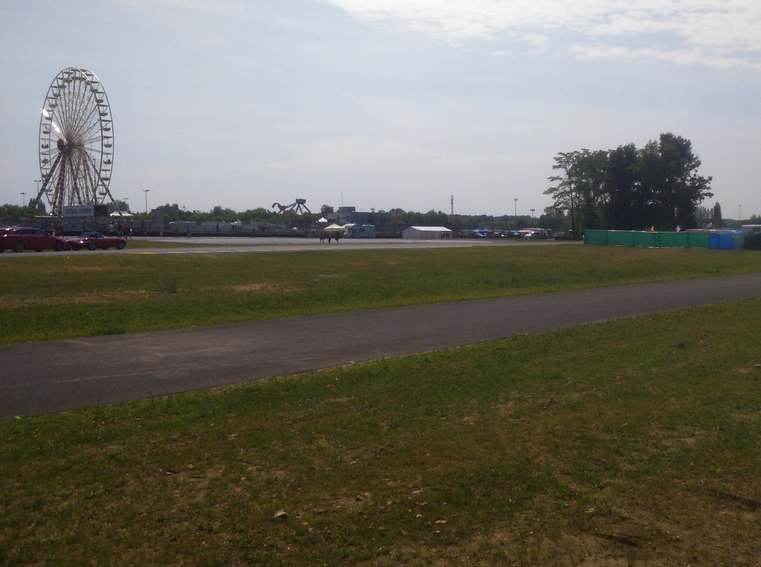 The use of the bottom of the site for the Ferrari challenge paddock entrance took away the best view of Porsche curves exit as the area was shut off to the public. However MB remains convenient for access to the start/finish straight and the Ferris wheel, if that sort of thing floats your boat. Talking of boats, No flooding issues at all!! For the fourth year running we were able to secure a pitch on Maison Blanche thanks to our loyalty to a particular ticket agent, it really does pay to build a relationship if you are keen on one of the more popular camp sites. Anyway, we found ourselves on an oddly empty camp site as the ACO seemed unsure how much the Porsche Experience works would affect capacity they had left large areas of the camp unoccupied, this did mean that the loos and showers were less intensively utilised and less throughout the weekend. Our pitch was on row Z which is literally trackside, great for viewing the cars from the comfort of your pitch but as the cars circulated in the early hours you could feel the ground shake beneath your tent. All in all MB is a great camp which is why it's so hard to get on to. The location and size makes it the first choice for many and it will continue to be our camp of choice until it no longer exists. I feel slightly guilty about posting this because, as most are aware, unless you have a history going back to the year dot with a ticket company, it will be practically impossible to get on there. For the lucky few it was brilliant, most of the lunatics are now elsewhere, there was plenty of room even late in the week so it was very different. I would even say better, plenty of room for parking on the unused pitches. The picture below was taken on Friday. It seems crazy that the ACO are turning their back on all this revenue so obviously things will change. Very worrying for us regulars. The thing with MB is location location location. Toilets, showers etc were fine, even on Friday and Saturday. Cleared very quickly after race so security may be an issue for people staying till Monday. Triple pitches were unaffected by the changes, but far fewer standard plots. Some ground not being used with no obvious reason why. With the banking gone the site is noisier during the race. With the "Big Wheel" now sited on the opposite side of the track there are fewer "walk in" spectators, so feels slightly more secure. Slightly subdued atmosphere compared to the old days. On the plus side, the mini scooters and bikes that used to race around the campsite tamac have now been banned. Pitch Size : No change, although I do think the triple pitches by the back wall are a little more generous than the standard 7m by 5m on the rest of the site. This can obviously change from year to year. Facilities : As mentioned, perhaps one more shower/toilet block would be of benefit but again the attendants do a good job of keeping the facilities clean. Atmosphere : Still a mainly Brit enclave with a relaxing, friendly atmosphere. Your neighbours will always be your best friends so get to know them. Also, getting from the main gate to your pitch without stopping for, or being offered, a beer can sometimes be an issue, but a nice one! Security : Only one issue I’m aware of this year, so maybe it’s fair to say it should be taken in isolation. Standard sensible travelling / camping precautions should always be taken. The Look-a-Likeys were on the site within 1 hour of the race finish so Sunday night keep your eyes peeled. Pitch Size: This was a problem. Only really big enough for a small tent and small gazebo, you really needed another Camping Pass so that you could park your car. 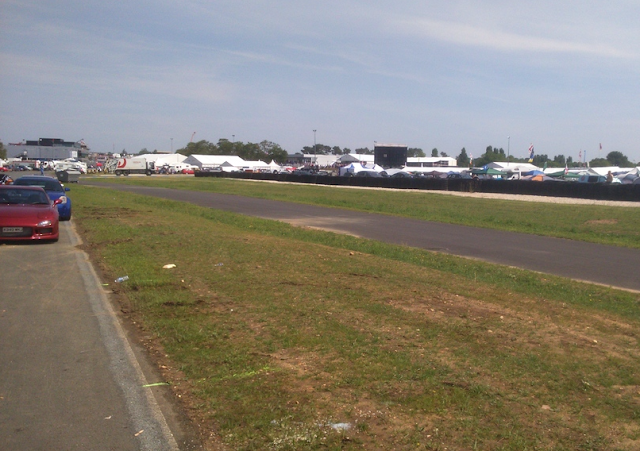 The pitch sizes and layout was enforced and subsequently by Thursday the site felt very crowded. My recommendation would be to make sure you have maybe one more pass than you think you will need. Facilities: Were the same for this year as they have been for many years. Not enough showers and toilets to cope with the demand. To their credit the Attendants try their best to keep them clean though. The shower block by the main MB entrance was a good bet as not that many Campers realised it was there, ruined that now haven't I? Atmosphere: Very good with the usual cosmopolitan mix biased towards English, but watch out for the Marauding Danes as they visited us and nearly cleared us out of beer. Very good company they were though. Security: There was a problem with thefts this year, which were perpetrated it would seem by some English Chavs. My recommendation is to make sure if it's valuable or useful, to lock it away in the car, or make sure it's secure.